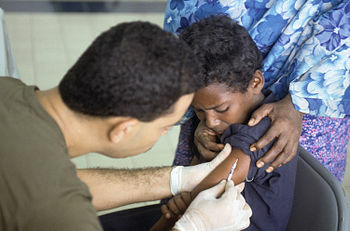 A Somali boy receives a polio vaccination at the Tunisian hospital in Mogadishu. The hospital treats local diseases, malnutrition, and other injuries. In December 2012, in the small village of Gouro, Chad, Africa, situated on the edge of the Sahara Desert, five hundred children were locked into their school, threatened that if they did not agree to being force-vaccinated with a meningitis A vaccine, they would receive no further education.These children were vaccinated without their parents’ knowledge. This vaccine was an unlicensed product still going through the third and fourth phases of testing. After being shuttled around like cattle, many of these sick, weak children were finally dumped back in their village without a diagnosis and each family was given an unconfirmed sum of £1000 by the government. No forms were signed and no documentation was seen. They were informed that their children had not suffered a vaccine injury. They are playing with the lives of our children and Bill Gates, among others, must be stopped before they injure or kill all our children. Gates has publicly stated he can lower the worlds population by the use of vaccines.